SWAN Districts is back home to Steel Blue Oval on Saturday desperate to return to the WAFL winner's list against Perth in celebration of NAIDOC Round. 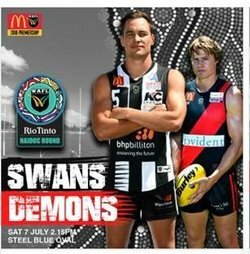 Swan Districts returns to Steel Blue Oval on Saturday on the back of a three-game losing streak and they do need a win on Saturday as part of NAIDOC Round in the WAFL to remain inside the top five. However, Perth is fresh off the bye and having won two of its past three matches looking to get a win that would see them close further in on a finals position. Swan Districts comes into the game in fourth position with a 5-6 record but the black-and-whites have lost their past three matches by 20 points to Claremont, 82 points to Subiaco and 18 points to Peel Thunder. Perth, meanwhile, had the bye last weekend and before that lost to West Perth by 21 points. But before that the Demons had been impressive with wins against South Fremantle and East Fremantle to put themselves in contention for a first finals appearance since 1997. That means that while Perth sits in eighth position now coming into Round 14, the Demons do have a 4-7 record to be only one game outside of the top five. With Swan Districts trying to hold on to its position in the top five and Perth trying to break into it, it sets the stage for a fascinating contest at Steel Blue Oval on Saturday. The two teams have already played twice this season starting with Swan Districts overrunning Perth in Round 1 to win by 45 points at Lathlain Park. Then at Round 9 at Steel Blue Oval, Perth started on fire leading by 40 points during the second quarter before Swan Districts took over and ended up winning by 30 points. Both teams will wear specially designed Indigenous themed jumpers in celebration of NAIDOC Round in the WAFL. The Swan Districts jumper design has been created by students in the Pilbara region with the design in recognition of the Swan Districts' regional zone. Swans league team is set to feature Indigenous pair Warrick Wilson and Albert Dean with Kirk Ugle still unavailable through injury. Perth's jumper design infuses energy waves throughout the original red slash to signify strength. The Demons team is set to feature Indigenous players in the league team Michael Bennell, Devin McFarlane, Brant Colledge and Cody Ninyette. A Welcome to Country performed by local elder Di Ryder will feature before the men's and women's teams line up in their NAIDOC jumpers. The Swans women’s league team will play Perth Angels at 12pm before the men’s game at 2.15pm. The women’s team will be wearing NAIDOC jumpers designed by local artist Kylie Graham. A Marngrook (traditional Aboriginal) exhibition game, facilitated by the Stephen Michael Foundation and Noongar Wellbeing & Sport, will be played at half time. Boomerang and Australian animal painting, mosaic flag making, and bracelet beading will be taking place in the Swans Play Zone. Coming off the loss to Peel Thunder at Bendigo Bank Stadium last Saturday by 18 points, there are no outs for Swan Districts at this stage. But Steven Wityk, Nathan Blakely and Albert Dean have been added to the squad. Dean is coming off the high of kicking the winning goal against Peel in the reserves last Saturday after the siren and could come into the Swan Districts team during NAIDOC Round. If Blakely passes a fitness test and is able to make his return, it will be a significant inclusion for Swan Districts. He can take back over the No. 1 ruck role meaning that Corey Gault can go back to spending more time forward with Brayden Noble also able to settle in the forward-line. Perth is coming off the bye last weekend and prior to that a loss to West Perth. From that team, the Demons have added Zac Hill, Kurt Nicholas, Spencer White, Brad McPhail and Shaun Smith to the squad. If White is able to make the final 22, it will be a significant inclusion for the Demons with the former St Kilda top 10 draft pick to given them a strong key target in attack. Perth's cause won't be helped with the loss of defensive pair Mitch Lague and Ben Giobbi.